Why Does This Gucci Model Look So Miserable? The Thanksgiving Day newspapers landed with a thud on the front doorstep. Even now in this digital age when most of us get our news online, the papers are stuffed with expensive colorful circulars and retail ads. Most of the mass-market pitches are bright, loud and pretty straightforward, proclaiming “Black Friday Deals” and “Doorbuster” Specials. High-end retailers push plush sweaters, eye-catching jewelry, bags and warm coats. It’s all part of a not very subtle push for our holiday retail dollars. But why is it that all the models for JCPenny, Macy’s and Target have nice, broad smiles on their faces, while the Gucci and Prada ladies appear to be downright miserable? What’s their problem? They were paid good money for their modeling gig. I’m not a marketer, or a brand consultant. So it’s beyond me why The Dior woman is glowering from behind a fancy pair of sunglasses on page 3 of The New York Times and the Sauvage fragrance guy on the back page looks like he’s about to punch somebody out. Who wrote the memo that it’s hip, edgy or in-the-know to look like you’re having a crappy day? Does dystopian angst help the elite-tailers sell more stuff? Come on. It’s Thanksgiving. Be happy and express some gratitude. Most of us are blessed with love and a measure of prosperity. Even those who rule at the fashion fortresses could offer something that’s less forbidding and cold. Above: JC Penny circular. Top: Gucci ad The New York Times 11/26. To a greater or lesser extent, we all live in filter bubbles. Only truly shocking events shake up our view of the world. 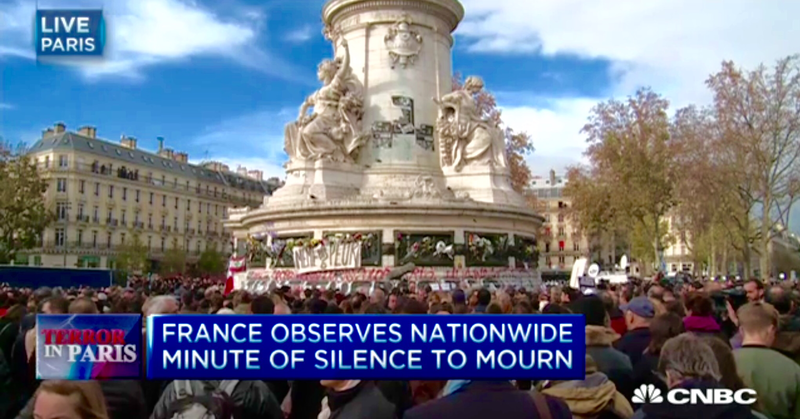 The 11/13 Paris attacks were the latest assault on our senses. Intelligence officials, police, politicians and the rest of us are dealing with a new reality – that ISIS and its hateful, nihilistic celebration of death are a greater threat to our way of life than most of us had assumed. “The Paris terror attacks suggest that the U.S. and its allies overestimated recent successes against Islamic State while underestimating the group’s ability to strike far from its Middle East stronghold,” is the assessment of analysts who spoke to The Wall Street Journal. The attacks are reminders of past U.S. intelligence failures – in Vietnam during the 60’s, Iran with the fall of the Shah in 1979, and the rise of Al Qaeda before the 2001 attacks. Institutional confirmation bias prevents us from viewing events through a different lens. Perhaps it’s time for a little collective humility about our ways of viewing the world. “In psychology they call thinking that you see the world as it truly is, free from bias or the limitations of your senses, naive realism,” says David McRaney of the “You Are Not So Smart” podcast. Our “facts” are often little more than opinion, says McRaney, a recent guest on our show, “How Do We Fix It?”. With the events of the past few days, even politicians would do well to reassess some of their views. “The assault on Paris has thrust national security to the heart of the Presidential race, forcing candidates to scramble,” writes Jonathan Martin in today’s New York Times. Perhaps voters will react as well, prompting them “to reconsider their flirtations with unconventional candidates and to take a more sober measure of who is prepared to serve as Commander In Chief.” The demands on the candidates will be more exacting, writes Martin. But what of our own views of freedom and tolerance? Will we become more fearful and less hopeful about what the future can bring? Hopefully not. But hate is what we must be most careful to guard against. “Hatred is political currency, coveted by Al Qaeda and ISIL, but more dangerously, by right-wing groups among us,” says Ghosh in his perceptive article. It’s time to be calm, strong and open-minded about the views of others, but also resolute: Recognize the lethal threat that a relatively small number of Islamists present to us (and, yes, call them what they are). Yet also be confident about democracy’s strengths and the values that the great majority of us share. The Friday night lights of young multi-racial, multi-ethnic Paris before the carnage struck were symbols of western civilization’s trust, joy and strength. They must not be snuffed out by the actions of a few.